I am writing this column for publication in December, but it is a week and a half before Thanksgiving and the day after our Fall Feast. However, it is my only opportunity to wish you and your family my best wishes for the holidays. 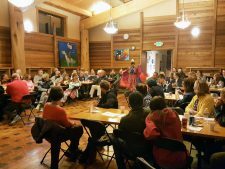 Last evening we had the District 8 Fall Feast in Seattle. It was a lot of fun and had almost 70 members and their spouses there. I’d like to especially thank Leslie Deer for coming all the way from Oklahoma to show us traditional dances and to get members up and round dancing. Another key presenter was author Peggy Anderson, who wrote a soon-to-be-published children’s book about the Potawatomi Trail of Death called Two Moon Journey. Aden Eilers, a recent PLP participant, made a presentation about his experiences in the Potawatomi Leadership Program. And Marines Rocky Chenaux of Kent, Washington, and Robert White of Castle Rock, Washington (mentioned above). As is the Potawatomi tradition, we recognized our wisest member present, Erma Pozzobon of Maple Valley, Washington. 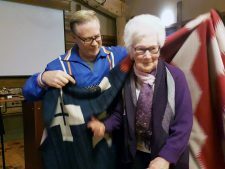 Erma is 87 years old and will enjoy her Pendleton blanket in good health for many years to come. 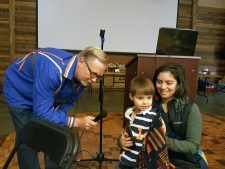 Our youngest enrolled member present was Mr. Jaeger Fox at 3 years old. Our farthest-traveled member, Mr. Adam Sharghi, drove from Corvallis, Oregon. Several years ago, we started the tradition of a members-only art contest. 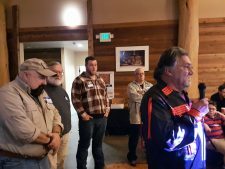 The winner of the grand prize (a beautiful Pendleton blanket) this year was Rick Eilers with a well-crafted cedar box that he had displayed and discussed earlier in the evening. The Eilers are very involved in CPN activities. As usual, many members stepped up to help the evening along when there was a need, but I’d be remiss if I didn’t say a special thank you to Robert White for assisting with the veteran’s awards, the craft preparation and general and numerous other tasks. Migwetch (thank you), Robert! As the year closes, I’d like to mention that I will be running for re-election as the District 8 representative in 2018. It has been a true honor to represent the Northwest members, and I’d appreciate your vote and support in the upcoming election.